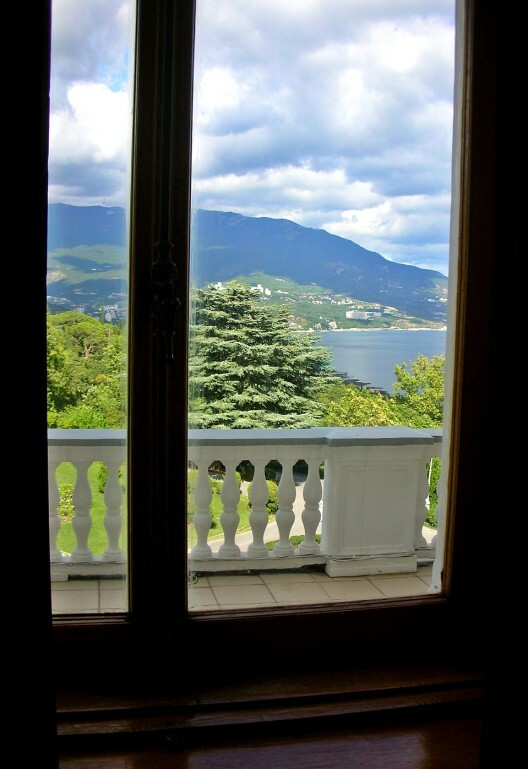 Leaving Yalta proper and heading southwest along the coast a few miles, you will soon come to Livadiya, home to Livadiya Palace, site of the world-famous Yalta Conference of February, 1945, when Stalin hosted Winston Churchill and Franklin D. Roosevelt near the end of World War II. 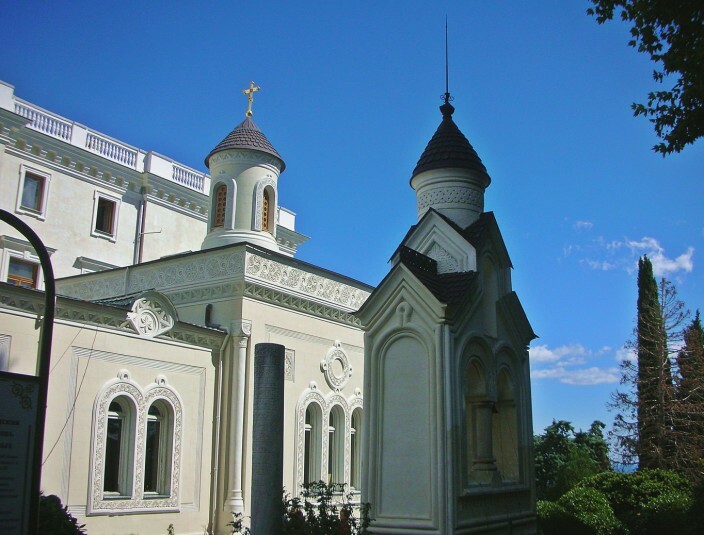 But long before that, Livadiya was the summer residence of the Imperial family of the Russian Empire, the Romanov’s, Czar Nicholas II and his wife Alexandra and their five children. 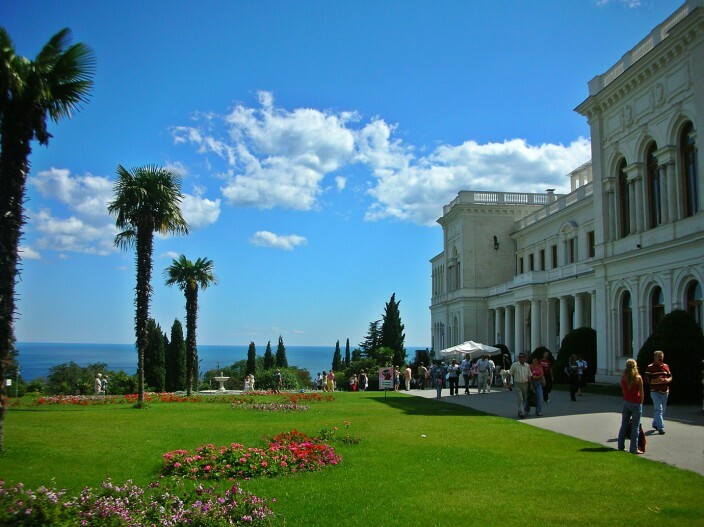 Built between 1909 and 1911 under the guidance of Yalta’s preeminent architect, Nikolai Krasnov, Livadiya Palace is a stunning example of Neo-Renaissance architecture, it’s white Crimean granite gleaming like an alabaster jewel on a sun-kissed hillside overlooking the Black Sea. 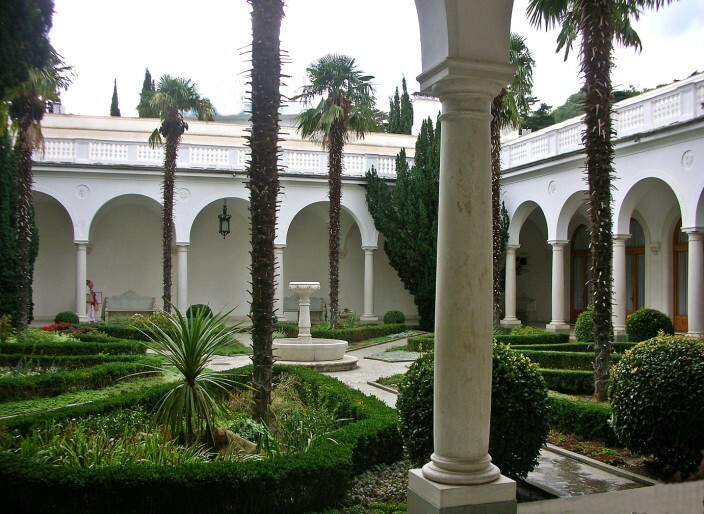 The estate had been in the royal family since the 1860’s with smaller palaces on the grounds used by Nicholas’ grandfather and father, Alexander II and III. Nicholas had grander ideas inspired by a trip to Italy and ordered the old buildings razed and the new one constructed, no expenses spared, naturally. The result is pretty darn magnificent, the crème de la crème of all the grand chateaus and castles I’ve ever had the opportunity to visit in Europe. 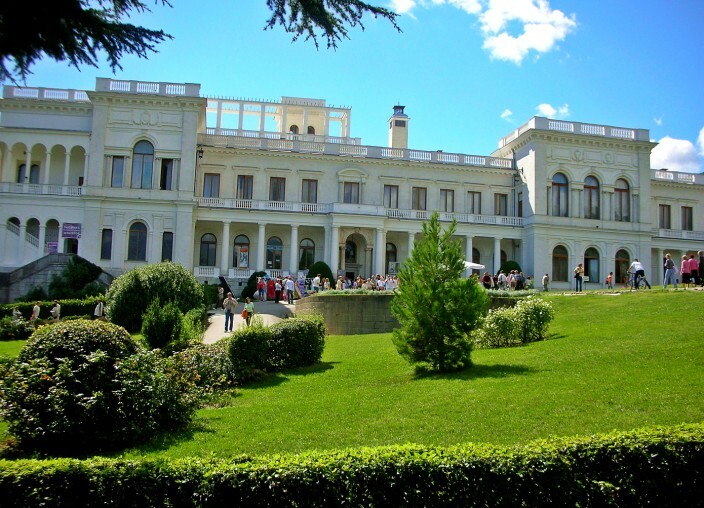 Certainly there are many of these extravagant, wealthy personal playgrounds which are bigger and more opulent than Livadiya, but for my money, there’s something about Livadiya Palace that exudes a certain class and elegance without seeming over the top. I don’t know if it’s the beauty of the architectural design, the materials, the layout, the surrounding grounds, or – most likely – the combination of all these elements integrated in a fashion that simply looks and feels just right. At any rate, it’s well worth your time and money to spend a day here simply for the beauty of it, but with Livadiya, unlike many of these noble houses, there is also a whole bounty of fascinating history these walls have witnessed. 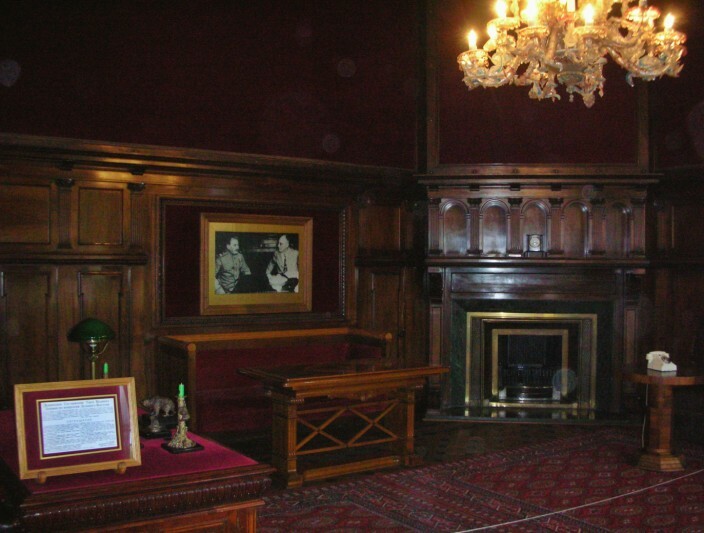 You get a real sense of that aspect from the guided tours which take you through the entire palace, room by room. As a big-time history buff, it was spine-tingling for me to stand in the same rooms where the fate of postwar Europe was hammered out by the Allied leaders during the week long Yalta conference. 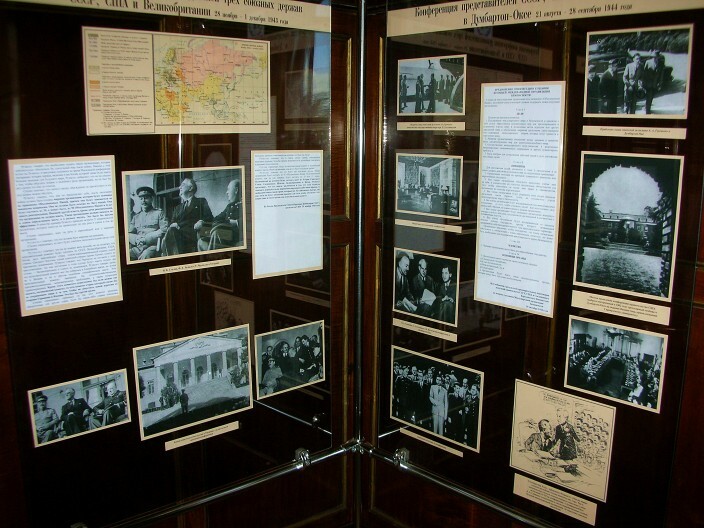 Photographs taken during the meetings are displayed on the walls of several of the rooms. I’d swear I could almost smell Churchill’s cigar smoke and hear Stalin growling and pounding on the table with his fists, while a sickly FDR sat there and acquiesced to far too many of Uncle Joe’s demands. 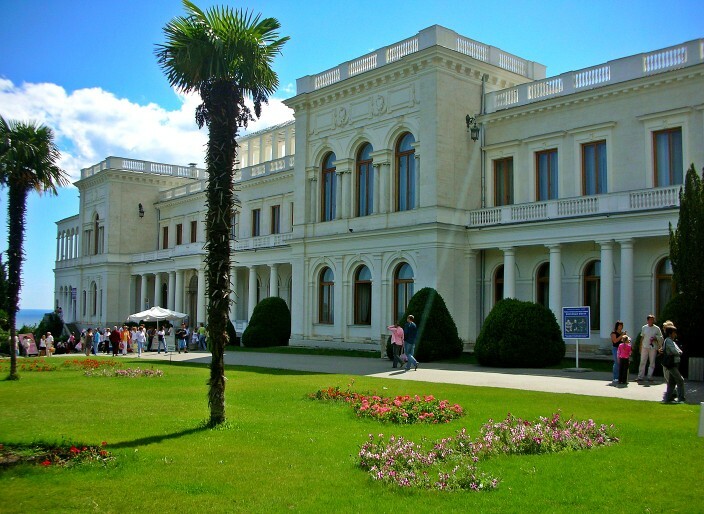 Two months later FDR was dead and not long afterward, the Cold War began, a conflict whose groundwork was unwittingly – or in Stalin’s case, wittingly – laid right here in the halls and conference rooms of Livadiya. 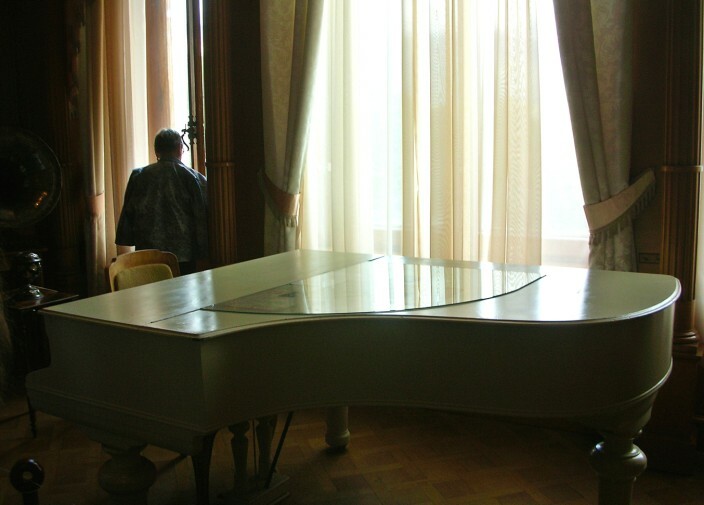 Historical ghosts of another era haunt the rooms and roam the corridors of Livadiya as well, those of the doomed Romanovs. Nicholas and Alexandra could scarcely have imagined they would only have six years to enjoy their marvelous new white palace by the sea before their entire world came crashing down and their empire with it, their lives and their children’s snuffed out in the revolution of 1917. In actual fact, it wasn’t even six years they got to spend there, rather only the autumns of 1911 and 1913 and the springs of 1912 and 1914. During the years of World War I they did not travel south from St. Petersburg. Then, on the night of July 16, 1918, they were all executed by the Bolsheviks in Yekaterinburg, far from whatever pleasant memories Livadiya might have held for them. 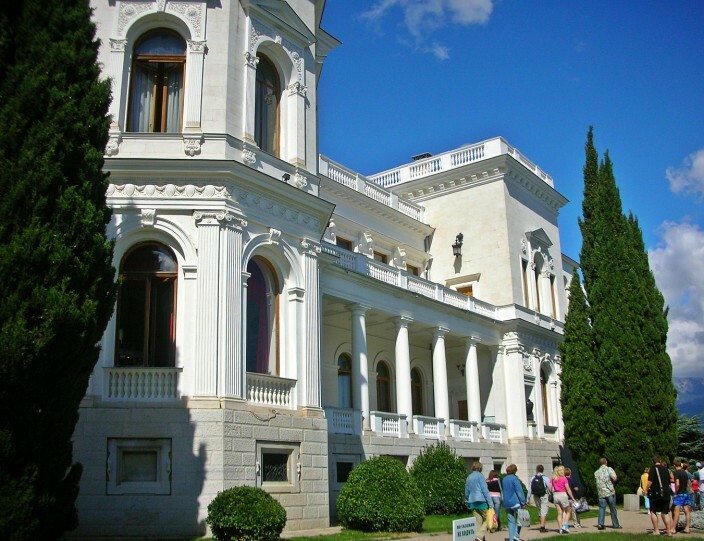 Long before the grim fate of Nicholas II and his family played out, however, Livadiya had been a playground for the royal family. 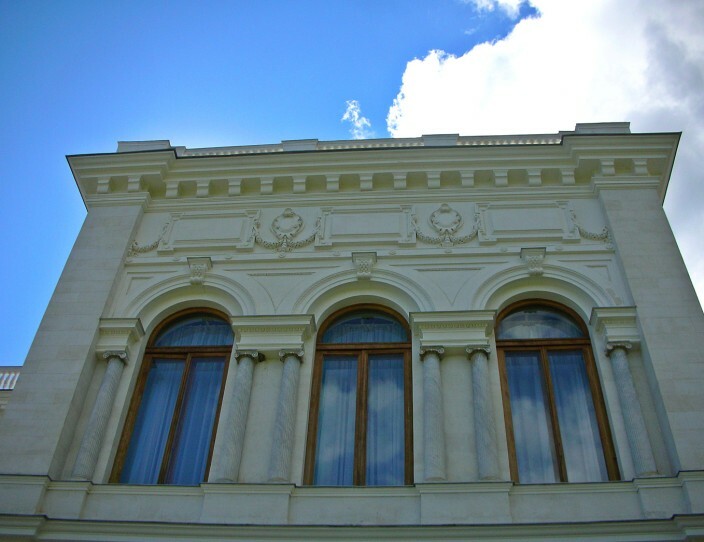 Alexander II built the first palace for his wife, who suffered a series of lung infections and resulting depression. Advised by doctors to leave the cold, wet marshes of St. Petersburg, they occupied Livadiya, and Crimea’s mild seaside climate immediately improved her health. They entertained many famous folks there, among them Mark Twain in 1867, coincidentally the same year Alexander sold the Russian Territories in America – Alaska – to the U.S. But Alex II died in 1881 in St. Petersburg from an assassin’s bomb tossed into his carriage. His son, Alexander III, and his wife came to Livadiya together for the first time in 1884. 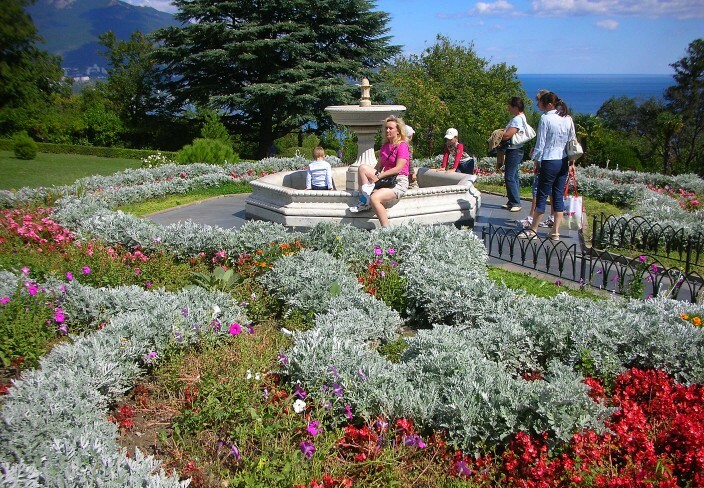 Their frequent residence made Yalta the place to be and the town’s popularity and size increased accordingly. Unlike his Papa, Alex III died quietly in his bed at the first Livadiya Palace in 1894, a victim of nephritis at only 49 years of age. And so it was left to his son Nicholas to tear down the old and raise up the new, and still standing, palace of Livadiya. 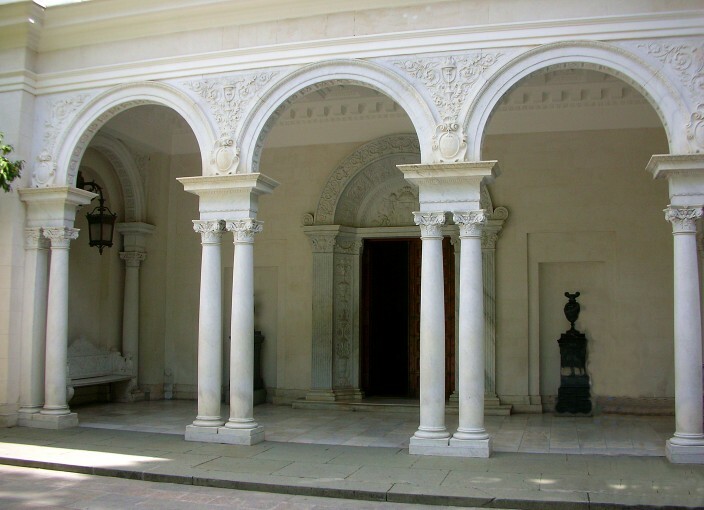 The present day grounds incorporate a number of different influences such as an Italian courtyard with fountain, a smaller Arabian courtyard in Tatar style, an English billiard room in Tudor style (where the crucial Yalta Conference documents were signed) and the immense White Hall, used as a meeting room during the Big Three conference, and as a grand ballroom by the Romanovs. 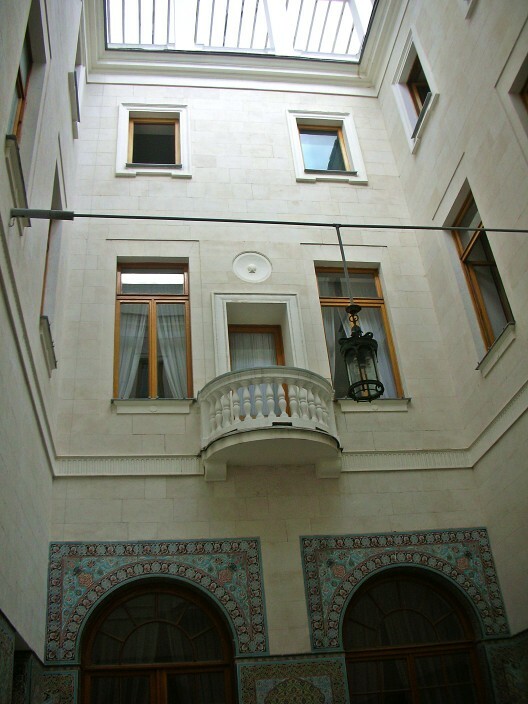 At 218 square meters (about 2,300 square feet) the White Hall gave the gentry plenty of room to waltz around or get lost in some remote corner and indulge in some royal hanky-panky. 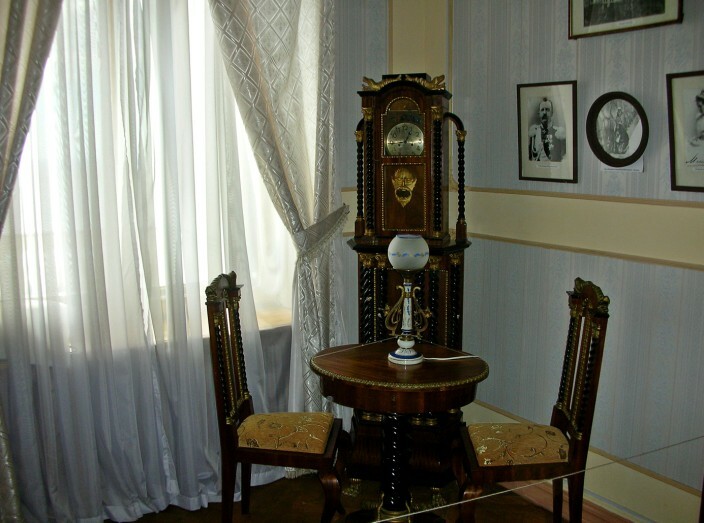 Visitors can also stroll through the family’s apartments on the first floor, including the Czar’s private study. Here you will find some of his own photographs adorning the walls, as Nicholas was a keen amateur photographer, while in the children’s classroom hang sketches produced by the four Romanov daughters. I found it all created a unique and quite tangible atmosphere, part melancholic, part nostalgic, of a lost age. I hesitate to use the word haunting because it’s so overused and cliched, and I certainly don’t mean it in a literal sense. I didn’t see any ghostly apparitions wandering the hallways or feel icy, invisible talons gripping me in an empty corridor. I’ve been in a lot of these houses/castles/palaces of the rich and royal, famous and infamous, and most of them are enjoyable to some greater or lesser degree. But I’ve never encountered one quite like Livadiya that impressed and impacted me on so many different levels – historical, emotional, physical – and somehow the combination of all these things made this particular place come alive in a special, more vivid way than any other. If you should visit this part of the world, it’s an absolute don’t miss recommendation from me, and I would hope it leaves you with some of the same cherished memories as I have.